The Limpkin (left and below) is a strange marsh bird of the New World tropics. It looks superficially like an ibis, has the general anatomy of a crane, and shares many behavioral traits with rails. Recent DNA evidence places it close to the sungrebes & finfoots (Sibley & Ahlquist 1990). Bryan (1996) calls it "one of the many remarkable birds of the Americas, with its unique appearance, unusual diet and extraordinary calls [and] an unusual variety of nesting sites, ritualistic courtship feeding, and a mix of monogamy and polyandry...". Between 1856-1934, the Limpkin was considered to be composed of two species, but now everyone agrees it is a single variable species. The two main types are shown in these two photos: South American birds (above & left) have unmarked dark brown backs and wings, while northern birds such as those in Florida (illustrated below or right in another nice Greg Lasley photo) have backs & wings heavily spotted with white. 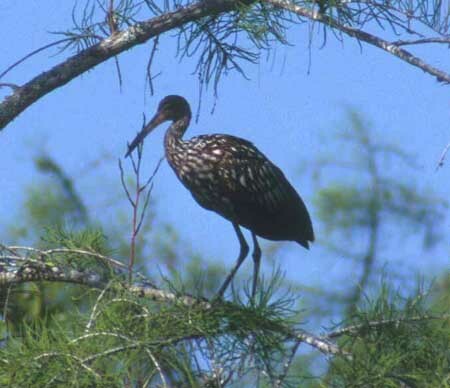 The English name "limpkin" comes from "a characteristic limping gait" but "this feature is by no means apparent to all observers" (Bryan 1996). I've never seen one "limp." I watched one in Florida just last week feeding on a small shaded pond by standing thigh-deep in the pool quietly -- like an ibis or stork -- while nearby Little Blue and Tricolored herons were stalking about slowly on the thick water lilies. In truth, although the Limpkin can appear awkward, it is a strong flier, a good swimmer, and a fast runner. John J. Audubon said the few birds excelled it in speed and that it could not be caught by even his best dogs. Bryan (1996) notes that the vocalizations of several males calling at once is "one of the weirdest cacophonies of nature." The calls are mostly given at night and have been described as: "a hoarse rattling cry like the gasp of person being strangled;" "little boys lost in the swamps forever;" an unearthly shriek" with the "quality of unutterable sadness." 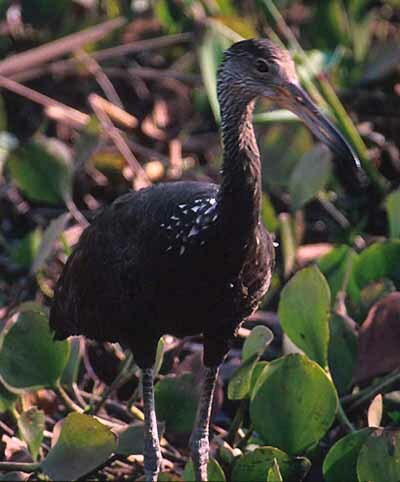 These night cries have led to many legends and tales, and in parts of Amazonia it is believed that when the limpkins begin calling in earnest, the water levels in the rivers will not rise any further. Photos: The upper photo of a southern Limpkin Aramus guarauna guarauna was taken in the Pantanal of Mato Grosso, Brazil, in July 1999; Greg W. Lasley took the lower photo of a northern Limpkin Aramus g. pictus in southern Florida in April 1990 . Upper photo © 2000 Don Roberson, lower photo © 2000 Greg W. Lasley (used with permission); all rights reserved. There is no "family book" per se of which I'm aware, but an excellent introduction to the family -- including much more on its biology -- is in Bryan (1996). Strangely enough, though, that introduction does not feature the variety of exceptional photos we have otherwise come to expect from the Handbook of the Birds of the World series. Bryan, D. C. 1996. Family Aramidae (Limpkin) in del Hoyo, J., Elliott, A., & Sargatal, J., eds. Handbook of the Birds of the World. Vol. 3. Lynx Edicions, Barcelona.